A tornado passed though Grand Rapids on the 20th, this one was shrouded in torrential rain. I watch the event unfold on TV. News 8 tracked the path using radar and maps right down to street level so even though sirens were blaring in my neighborhood, I was confident I was miles outside of the path. At one point, when the tornado was directly west of me, I looked out my front window and saw low gray rain clouds moving rapidly west, a phenomena in itself. The tornado was sucking the clouds out of my neighborhood. Fortunately the tornado damage was not bad – no lives claimed and mostly tree damage rather than homes. Fast forward to yesterday, more rain predicted and cooler weather, good trout fishing weather. I checked the condition of the Rogue River using the home page link, “Daily Stream Conditions in Michigan.” It had a light blue dot signifying water level was much above normal which meant, in effect, that the Rogue River feeder creeks would be flooded. Time to hit a feeder creek. As suspected, my target stream was high and muddy. I put on my biggest 3-hook floater minnow and worked my way upstream casting to the opposite bank as well as right up the middle. When the streams are muddy, fish can be anywhere. First fish, 20 inches. I netted it, de-hooked it, took a quick photo, measured it with a de-liar, and eased it right back in the water. Elapsed time, about a minute and a half. I try to move fast in order to make sure the fish is OK with minimal trauma and it was. It darted away. I’m glad I measured it. I had guessed about 18 inches. 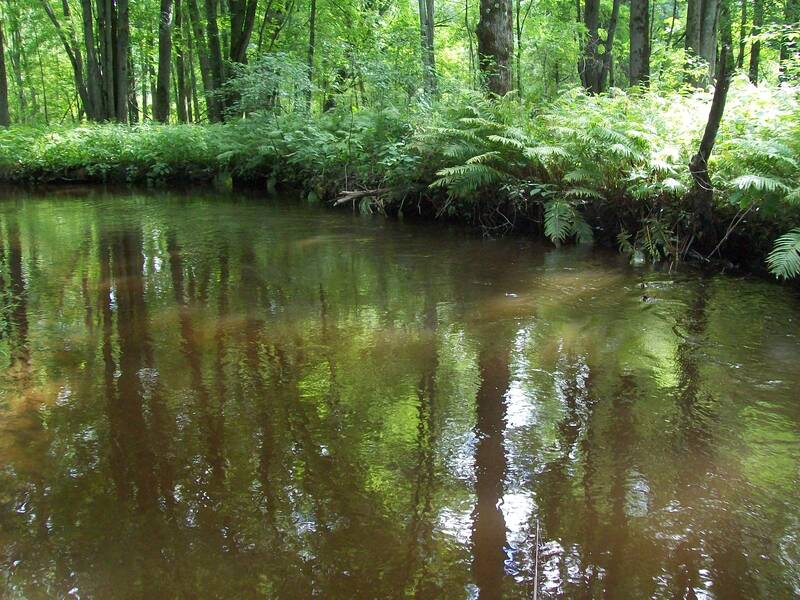 This particular stream is almost impossible to fish without a good drenching. It is normally so low and clear you are lucky to see fish and may swear it doesn’t support a trout population, let alone large trout. But when it is high and muddy, the dynamic changes, suddenly this sleeper comes alive. I continued upstream and lost one about 16 or 17 inches right at the net, but made up for it with another the same size. I had a stringer with me and was tempted to keep it but I had only been fishing about an hour and if I keep fish for the skillet I would rather have a couple 12 inchers – better tasting to my mind. 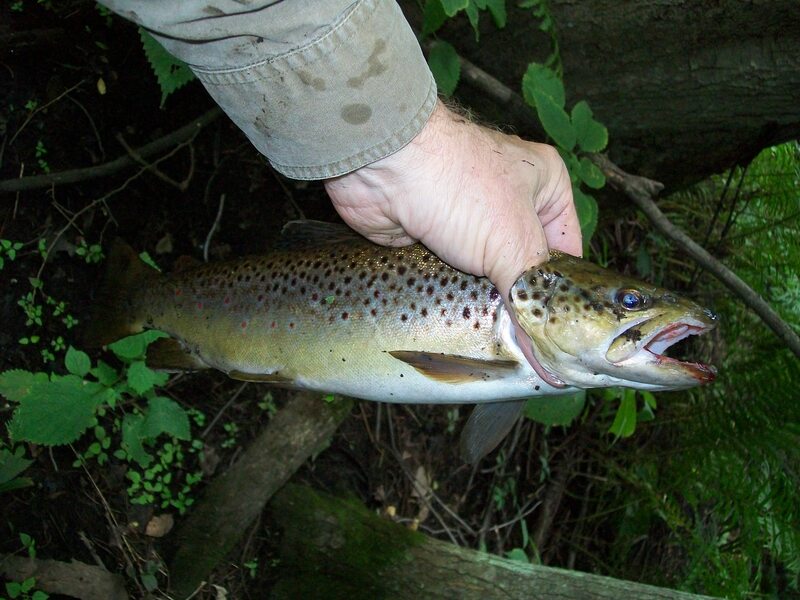 Nothing wrong with these trout though – absolutely beautiful stream brown trout. A little Cajun seasoning and a cold beer and no complaints. I did catch some smaller fish, on my biggest lurer, two around 8 to 10 inches, and only mention it to anyone that may believe you need tiny lures to catch small trout. Just not the case. Trout like a big meal. 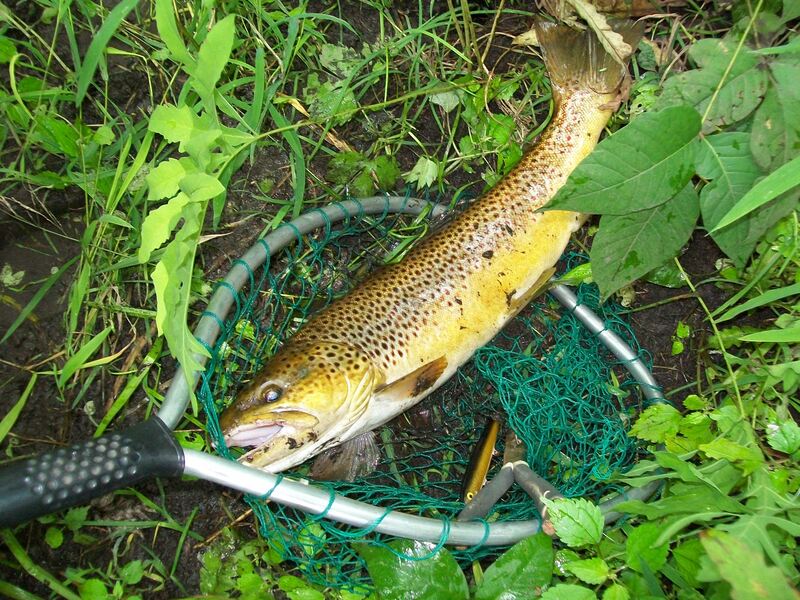 Further, if you are fishing muddy water, best to fish a large or flashy lure because trout need to see the lure though the muddy haze. After about two hours of fishing I was amazed to see a trout jump vertically clear out of the stream. I don’t know what he was after. 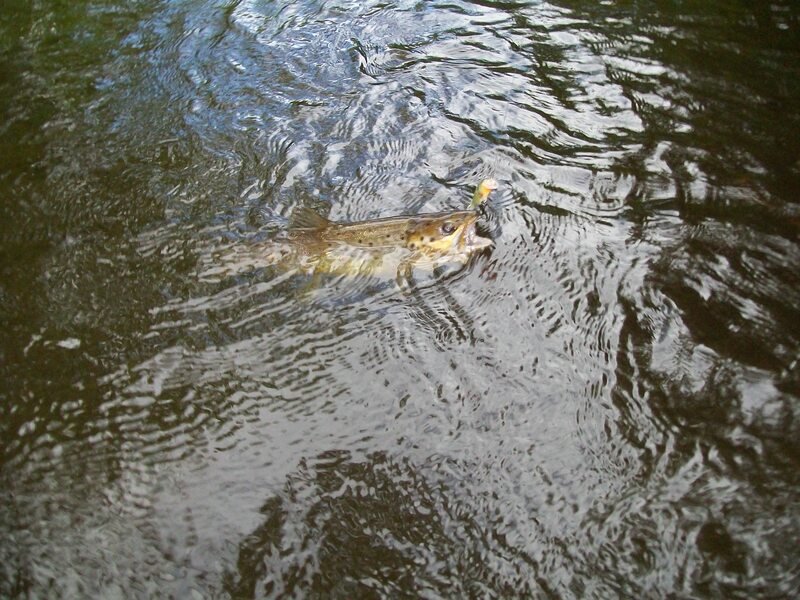 The fish was two feet long, the largest fish I have seen in this stream. I was able to move into casting position and worked the hole as best I could. Even tried a second lure thinking maybe something different might entice it. Nothing. It’s a little hard to ease past a hole like that. By then I was almost up to the bridge. I placed a cast into some cover and saw a nice one make a pass at the lure. Couldn’t get him to do it again so I placed a cast right up the middle of the stream and saw a swirl. Maybe a nice fish. It hit the second cast but didn’t hook. I tried again and it hit the lure again and didn’t get hooked. So I put on a deeper diving crank bait and this time he was hooked. He was about 17 inches. I unhooked him with my long nose pliars right in the stream versus netting him. I should have been more circumspect and kept him because my wife loves brown trout. When she heard the garage door she came out and asked how I did. I told here I did well, listing the sizes, followed by, “I didn’t keep any.” She said she didn’t want stories, she wanted trout. What rod/reel set up do you use? Thanks! Good question, currently using a 5 ft. ultra light rod – a Gander Mtn. Advantage IM6 with a full cork handle, along with an Abu Garcia underspin model 276UI. This is a great set-up for underhand flip casting into tight cover. Great catches and way to get out after all the rain. It’s such a contrast to the low clear water, then after the heavy rain it’s hard to believe the fish are right there. Exactly. I can see why a lot of new fishermen might get frustrated. Half the battle is making sure you fish the stream at the right time. My late grandfather and mentor used to say fish streams when the water is rising (in the rain). I had thought about going up there on the day of the tornado, before the warning, but then heard the sirens. As it turned out I had a beautiful afternoon, partly cloudy, and the stream was perfect… high and muddy.